A custom 3.5 x 4.5 picture frame tooth punch health magnet can evoke hearty smiles from anyone who sees them for the first time or regularly over their refrigerator doors at home. A promotional 3.5 x 4.5 picture frame tooth punch health magnet is usually preferred by professionals involved in dental services to promote their brand/business. 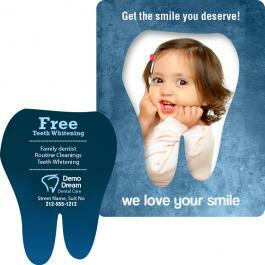 A personalized 3.5 x 4.5 picture frame tooth punch health magnet can be favored for gifting during and after service as well as during medical camps, blood donation drives, etc. A tooth punch picture frame magnet also serves as a reminder of next appointment date or it reminds a viewer about the special relationship that they share with a dentist. Product Size : 3.5 in. x 4.5 in.